What is the T Function? 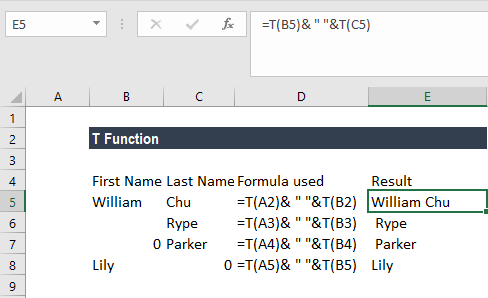 The T function is categorized under Text functionsFunctionsList of the most important Excel functions for financial analysts. This cheat sheet covers 100s of functions that are critical to know as an Excel analyst. It will test if the value provided is a text or not. If it is a text, the function will return the text, otherwise, it will return an empty text string. 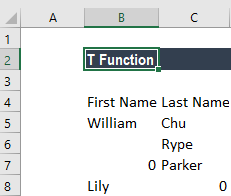 T is one of two functions in Excel that contains only one character. As a financial analystFinancial Analyst Job DescriptionSee a real Financial Analyst Job Description including all the skills, experience, and education required to be the successful candidate for the job. Perform financial forecasting, reporting, and operational metrics tracking, analyze financial data, create financial models, the T function is not much useful as Microsoft Excel automatically converts values as necessary. It is provided for compatibility with other spreadsheet programs. Value (required argument) – It is the value we wish to test. 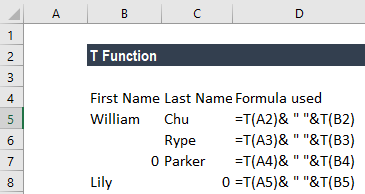 How to use the T Function in Excel? If the cell contains anything other than text, the T function will return an empty string. Hence, we got empty cells for numbers, dates and logical value. If we use the CONCATENATE function in row 7, the result would be “0 Parker.” It would be untidy and of no use, hence we used the T function.